50 Top Hits On 78 RPM! The music from those war years must have left its mark as I'm always filled by waves of nostalgia whenever I hear the big band sounds and hits from that era. In '44 dad was transferred to Victoria, BC (Esquimalt and Comox) and since my parents both loved to go to the movies, some of my first memories are of theatres with their magic images and soundtracks. Near the end of the war dad volunteered to serve on HMCS Prince Robert, a ship that was fitted with the latest in radar and armament and was part of a joint British/American fleet to free the Canadian POWs and to help facilitate the Japanese surrender in the Pacific. Mom and I returned to Strathclair to await his return. I have vague memories of his departure and return -- especially the goodbye hugs as he held me on his knee. 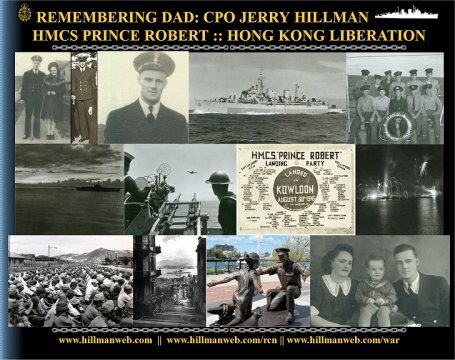 His ship had spent the summer of '45 in Hong Kong harbour and he returned with fantastic souvenirs, photos and stories that fired my imagination and which seemed to inculcate a livelong appreciation and fascination for travel, the military, adventure, Chinese culture, and exotic lands and music. After WWII I grew up on our family farm, Maple Grove, a half-section grain, dairy and livestock farm homesteaded by my great grandfather in 1878. This marvellous place with its pastures, waving grain fields, woodlots, towering spruce trees, ravine, sloughs, old stone buildings, and majestic red brick house would be the centre of my world until I left for university in 1961. Radio became my window to the world and I constantly roamed the dial of our big Westinghouse floor model, bringing in songs and voices from far-off places -- the equivalent of today's Internet. I became a sponge for every kind of music and radio programme -- shows that featured super heroes, mystery, comedy, SF, variety entertainment . . . and music of all styles. 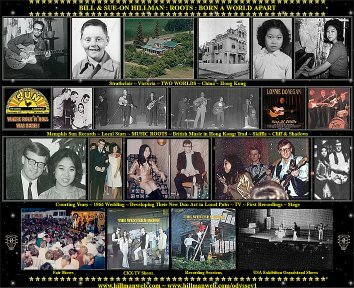 Through the magic of radio I discovered the stars of Sun records and followed the birth of rock and roll. In fact, I heard Elvis, the Hillbilly Cat very early -- on stations beaming music from the deep south in 1954: WSM, WLS, KXEL, KWKH, etc. And, wired into this booming radio, was a 78 rpm turntable on which I played, over and over, the family collection of records: Bing Crosby, Hank Williams, big bands, pop songs and western swing. Not long after I got my first reel-to-reel recorder I bought 77 episodes of the 1932 Tarzan series starring Joan Burroughs (Edgar Rice Burroughs' daughter) and her husband Jim Pierce (Jim starred as one of the last silent Tarzans in Tarzan and the Golden Lion). That got me started on years of trading for OTR shows reel for reel via mail -- thousands of shows. I catalogued them on my old typewriter and Gestetner copier. Later I traded copies with Vern Coriell his House of Greystoke publications and also sent them down to the Pierces after meeting them in Tarzana. In return they sent back all the Burroughs, Inc. titles and DJs they had in the warehouse. Later in the early '70s, during our music tour in the Peace River country, a morning DJ who MCed our show invited me to take away 600 16" ET discs stored in the radio station crawl space. I dropped around at 5 am and filled our VW Westphalia camper with them. The rest of the Western Canada tour was very cramped – Sue-On is a very patient and understanding mate :) It's been a bit of a struggle to keep my Gates 16" turntables and reel-to-reel recorders in working condition through the years – I have two stacks of worn out Reel recorders and VHS recorders. Since then I've collected thousands more shows in MP3 format on disks and computer hard drives. I discovered MAD magazine with issue 28 and immediately sent for their four back issue mags and bought all the pocket book reprints through the years. Their subscription offer for the magazine back then included a free issue of MAD comic #1 from 1952 which started me on a quest to find all the MAD comics that predated their magazine format. I collected the magazine through the years but gave up that obsession when they went colour with ads and raised the price. The Tarzan parodies that Mad, Cracked, National Lampoon, etc. featured are reprinted in my ERBzine.com site the official Edgar Rice Burroughs Tribute site of 15,000 Webpages. We had cattle and about 1,000 laying hens which I had to feed by carrying water, grain and chop by pails. My audience of cows and chickens gradually learned to put up with my vocal renditions of the hits of the day. I hauled out the manure, gathered eggs, milked the cows, and did the crushing, as well as shovelling snow, grain and coal. What money I saved from doing these daily chores went into buying records, books, magazines and comics. I talked my mom into sending for records through an ad that offered 50 hit songs for just a few dollars. Too good a deal to pass by. The package that arrived in the mail wasn't quite what we had expected, however. Each 78 rpm disc had three somewhat abbreviated songs per side ... and they weren't by the original artists. But there was some good stuff there: Sh-Boom, Sincerely, Moments to Remember, The Man in the Raincoat, etc. - pop and C&W and a whole lotta stuff I'd never heard of. My first real record purchase was at G.V. Henderson's Drugstore: That's All Right Mama b/w Blue Moon of Kentucky by Elvis Presley and the Blue Moon Boys on RCA Victor 78 rpm. Before long I had bought out his whole stock of Elvis records and had the entire collection of the singles Elvis had originally released on Sun Records. The next treasure trove of singles came as prizes for selling school magazine subscriptions: Fats Domino, Jack Scott, Gene Vincent and Little Richard. Sadly there was very little music in our school. We did however, get permission to clear out an old junk room in the school's basement and on days when the weather was too miserable for us to play baseball or football outside (guys and gals played tackle football all winter out among the snowbanks), we listened and danced to records. 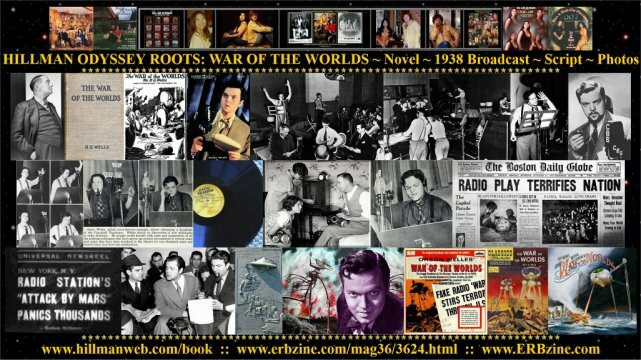 These were truly exciting music times -- the birth of rock 'n' roll and my own music awareness -- and today there are very few hits from the '50s and '60s that don't generate some memory from the past. My life then, as now, seemed to revolve around music. 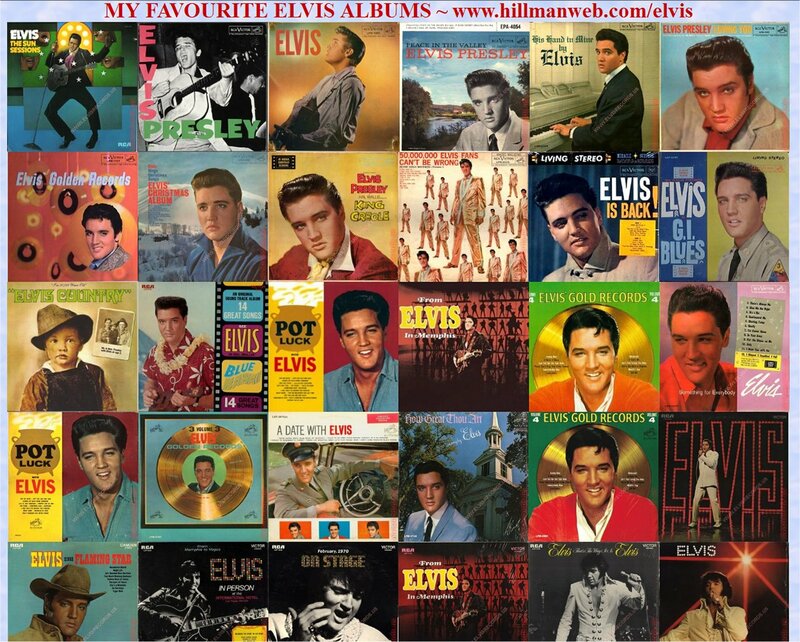 The arrival of Elvis on the pop scene was the event that kicked our Musical Odyssey into full gear. It led to gathering massive record, tape, video and book collections, an obsession for all things guitar, and a deep love for music of all kinds -- especially blues, C/W, and rock 'n' roll. The emergence of The Beatles a few years later only kindled the fire. 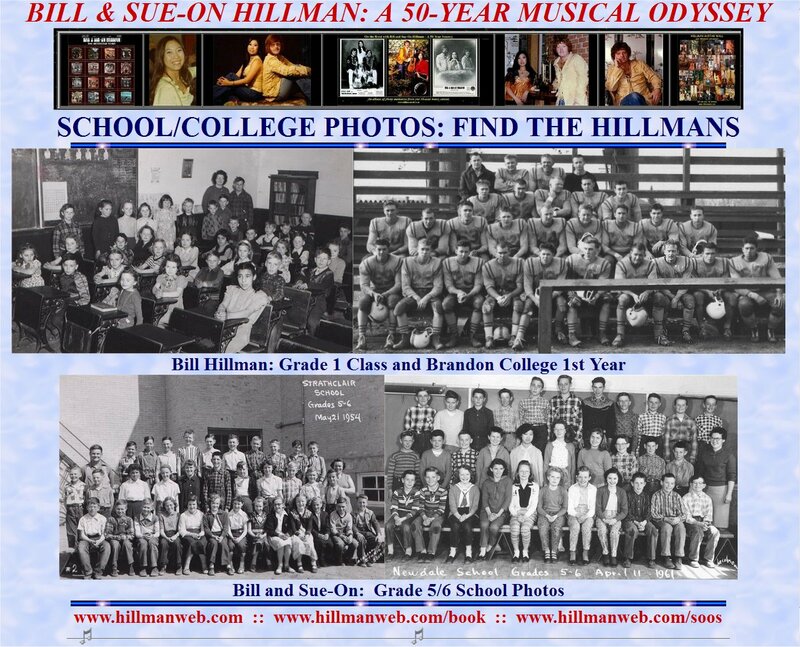 Later, Sue-On and I incorporated many songs from both acts into our performing repertoire. Road tours gave us the chance to trace the roots of both these acts. We stood on stages that Elvis had performed on for the Lousiana Hayride and Grand Ole Opry, visited his old Memphis haunts, marvelled at the Sun Records Studio in Memphis and the RCA studios on Music Row in Nashville, explored Graceland and his two jet aircraft, thrilled at his live performance in Las Vegas, and were shocked when we learned of his death while we were on tour in England. Our tracking of Beatles roots took us even farther afield in Liverpool, London, clubs in NE England and the Reeperbahn in Hamburg, Germany. I wore out the family's stacks of 78 RPMs on a turntable we had wired to our big console radio. 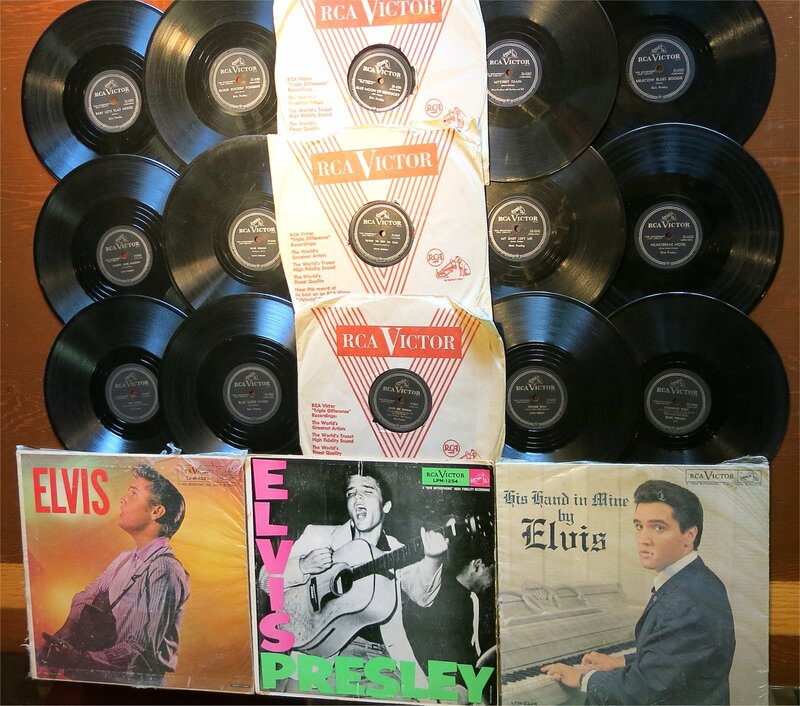 When Elvis records became available on RCA in 1956 every penny I could scrape up went to buying these $1 discs. But the big old 78s in my collection just didn't have the pizzazz of the new unbreakable 45s and LPs with their stacking turntables, colourful photos and peer acceptance. So, for many months leading up to Christmas '56, I started a campaign to make my parents very aware that our old turntable was terribly obsolete. Success! Under the tree that year was a portable RCA record player that could play all three speeds and all sizes of records. 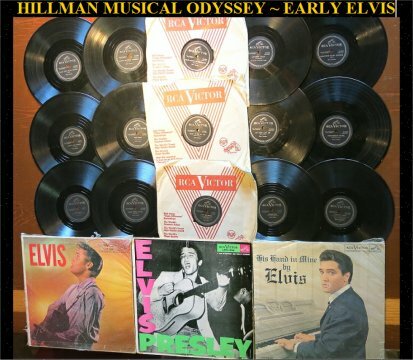 Along with this technological marvel was a selection of records from various members of the family: Elvis' second album, Bill Haley, Pat Boone and Crazy Otto (my Aunt Merna was a real fan), Tennessee Ernie Ford (my Nannie was a fan), and a few more. My record collecting and guitar playing now went into full gear as I could hide away in my room and play along for hours every day, picking guitar riffs off my growing collection: Elvis, Johnny Cash, Carl Perkins, Lonnie Donegan, Dale Hawkins, Gene Vincent, et al. This collection grew in leaps and bounds when I joined the RCA record club: Chet Atkins, Hank Snow, bluegrass, etc. My mother, sensing a bit of a music obsession, enrolled me in piano lessons for a couple of years. Silly kiddie tunes, scales and boring practises just never captured my imagination... this wasn't the music I was hearing in my head. My sister Bonnie took the lessons much more seriously and became very accomplished on the keys. . . but alas . . . not for me. Mom tried to kindle the fire by buying sheet music for songs in which I had shown some interest: Love Me Tender, Don't Be Cruel, Third Man Theme, etc. Dad's sister, Aunt Merna, tried to get me to put some excitement into my dreary plodding by giving me pointers on syncopation and rhythm. My music teacher added an element of fear through weekly scoldings and rapping my fingers with her pencil. And around this time Jerry Lee Lewis came on the scene with his pumping piano to show just how exciting a piano could sound. But he was too late. Living on a farm in the country meant that I didn't have a chance to mix much with kids my own age. But this had advantages as well. My grandparents lived with us and we all shared a love for music, movies, radio, and books which created close family bonding. The birth of my sister Bonnie was an exciting event. She was four years younger, but soon I had a little companion to play with and to join me in adventures in make-believe worlds. Again, music became a bonding force and she became much more accomplished than I on piano. Bonnie developed a fine singing voice which led to some neat sing song sessions. She grew into a beautiful lady and worked as a model when she moved to Winnipeg. She also worked as a travel agent and led vacation tours to exotic places. That love of travel never left her and after she married Dr. Michael Schneider, she and their four kids moved to Saudi Arabia where Michael was revered as an esteemed surgeon. From this location they had many adventures as they travelled worldwide and the kids were enrolled in some of the world's finest Medical schools. Daughter Lee Noelle showed that love of adventure by spending a high school year by travelling around the world as a working/learning crewman/student on a tall ship. Piano lessons weren't cool. . . this was a little before Jerry Lee. Elvis & Scotty and Johnny & Luther, and all the cool rockers played guitar. So. . . dad came home from Winnipeg one night with a Harmony Monterey archtop he had bought at Ray Hamerton's. That was cool. . . a dream come true. But it was tough going for awhile since the strings hovered way above the fingerboard -- bleeding digits until calluses were built up. Dad showed me a few runs . . . and one day proudly boasted that he had heard a hit song on the radio -- I Walk The Line -- that used the same runs he had taught me. For a while then, Luther Perkins was a bit of a mentor : ). Encouraged by all this, dad soon added a 5-string banjo and autoharp to my arsenal. Uncle Don then showed me how to put some chords to some simple folk songs and I was on my way -- picking up ideas, riffs, chords from every guitar player I saw. Music continued to be a driving force: I sent for a Doc Williams acoustic guitar course from a Wheeling West Virginia radio station, and Mom bought music folios with guitar chords. About the only good thing about being shortsighted and having to wear glasses was that I got to go to Winnipeg for appointments with an eye doctor in the Boyd Building. I saw Elvis's Love Me Tender, soon after it was released, in the Metropolitan Theatre -- well, "heard" more than "saw" because I had just come from an eye test and examination and had drops in my eyes. I also went to my first major music concert -- at the Playhouse Theatre -- little knowing that in 20 years I would have the thrill of appearing on this same stage many times myself. But back then though, I was dazzled by the lights, the sound, the applause, the velvet curtains on the stage -- and the guitars! 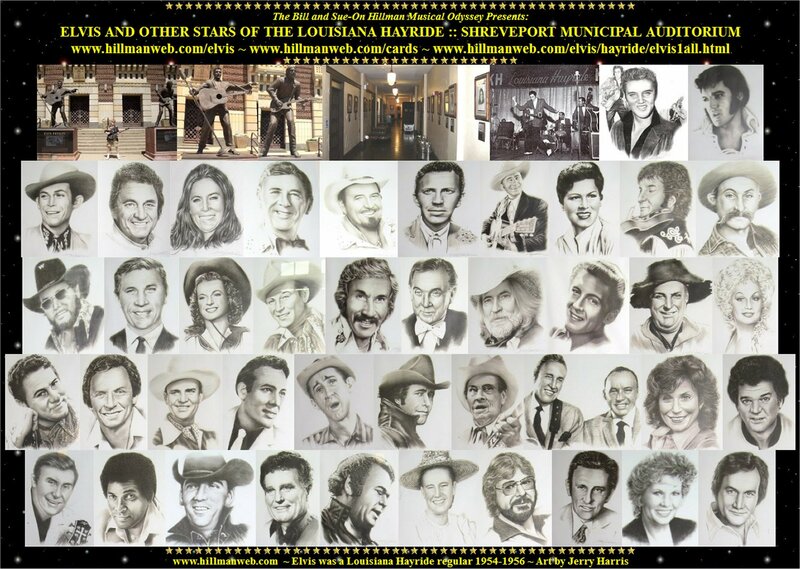 The show featured Jim Reeves, Johnny Horton, Country Johnny Mathis and Charlie "Hot Rod Lincoln" Ryan. On later trips I returned home with hard-to-find Lonnie Donegan skiffle albums and LPs by England's guitar instrumental group, The Shadows. The Strathclair Bend Theatre has been one of the major influences on my love of music, movies, and entertainment. I have fond memories of the times my grandfather, Jack Campbell, took his 4-year old grandson to the construction site of what would become the Bend Theatre. The theatre was a dream project of Grandpa's friend, Paddy Trim. Mr. Trim made a deal with Alex Kippen, who owned a lumber mill in the Riding Mountain area, to provide the lumber for construction. I remember standing in awe in the middle of this huge building which had just started construction. Up until this time I remember attending the showing of movies in the Strathclair Hall -- sort of a make-shift theatre. It was a thrill then, when our family attended the grand opening of the luxurious finished theatre. The debut movie was "The Egg and I" which saw the debut of the Ma and Pa Kettle characters which were soon spun off into a series of their own. The theatre derived its name in recognition of the original Strathclair settlement which was located some distance north on a "bend" in the Little Saskatchewan River. The town was moved south for better rail access when the CPR line was constructed through that area. The Bend was a magical place. Long before the advent of television in our community this was my window to the world. From that opening in 1947 all through my toddler and teenage years it provided wonderful entertainment to my family -- indeed, my weekly allowance was nearly always spent at the Bend box office which was my portal to a full night's entertainment on the giant silver screen: newsreels, Three Stooges amd other comedy shorts, Warner Brothers and Disney cartoons, adventure and SF serials, and exciting previews of the upcoming features. Then the house lights would go on and girls with concession trays full of ice cream bars, candy, popcorn, etc. would make their way down each aisle. While the girls were selling these treats, slides would appear on the screen providing local news and ads. When the lights dimmed we settled in to watch the main feature -- all the latest films that Hollywood had to offer. My favourites in those early years were westerns, Tarzan movies, science fiction, musicals and screwball comedies. The next major construction to the theatre was the expanding of the stage area in 1954 to accomodate the new wide-screen Cinemascope films. I remember attending what I believe was the first such film shown there: Prince Valiant starring Robert Wagner. It was disappointing to see much of the beauty of the proscenium arch removed for the expansion. These influences stayed with me and evolved over the years -- leading me into becoming a compulsive collector of many thousand movies and radio shows on tape, disc and computer. The wonder of far-off exotic places shown on that screen led me to become a compulsive traveller to distant lands -- something that my wife Sue-On and I have done constantly since we were married in 1966 -- it was also major impetus to become a geography teacher and professor. The Bend also provided a showcase for live entertainment -- both local and professional. Winnipeg radio stations promoted entertainment troupes by featuring live music shows on the air. These bands would use this exposure to advertise their live shows in showhalls and theatres such as The Bend. Station DJs, such as Porky Sharpeno, would moonlight as emcees on these shows and would usually plug the show all week on their radio shifts. 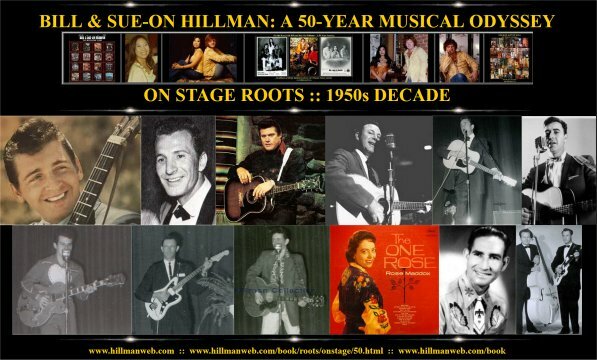 The stage shows featured a nice mix of country songs and instrumentals, pretty girl singer, cornball humour, audience participation, costumes, lighting (black light was a favourite gimmick), and sale of photos, programmes and songbooks. The first such show I remember was that of the Ray Little Gang. I still have the photo and song booklet that they sold at this gig. In fact, years later when Sue-On and I were looking for good material to record on our albums I referred to this booklet for the words to The Kentuckian Song. (This was many decades before the Internet and Google made such song searches much easier). I have fond memories of being on the Bend stage in the early days -- mostly Christmas concerts: doing a poetry recitation as a scared-stiff grade one student and later performing in a silly skit in shorts and a sailor hat for an air cadet show, and still much later playing a guitar solo of "Silent Night." During my 30 years as a high school teacher at Strathclair Collegiate we often made use of the Bend for school dramas, initiations and graduation events. I remember, in all my years as a devoted a movie-goer, that I usually sat half-way down off the right aisle. Curiously, I chose this same location for every movie I attended in Brandon's Strand theatre after moving to the Wheat City as a Brandon College student . . . and even later when we moved to Brandon to take over SOO'S Restaurant. Old traditions die hard. Sadly, Sue-On and I never had a chance to perform our music on the Bend stage. 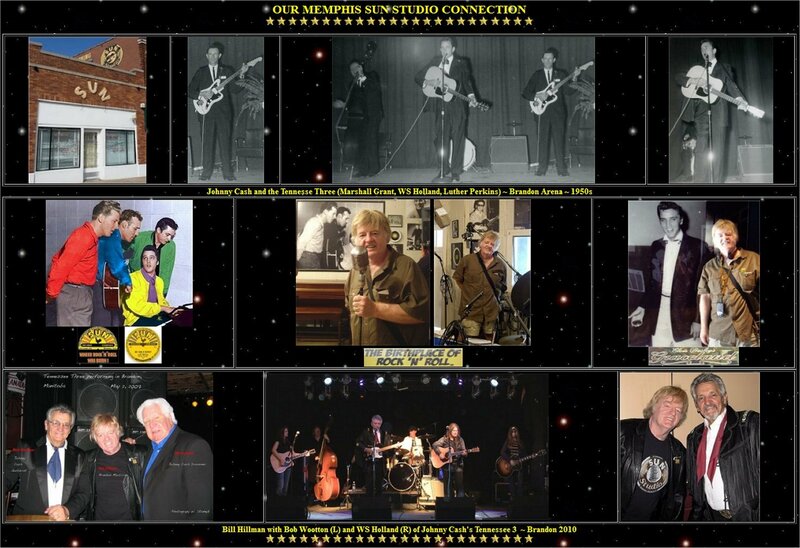 I was a devoted fan of the early rock 'n' roll that came out of Sun Studios of Memphis: Elvis Presley, Johnny Cash, Carl Perkins, Jerry Lee Lewis et al. The stage show in our local Bend Theatre that stands out most in my memory was the Hal Lonepine / Betty Cody Show in the mid-'50s. Accompanying this husband and wife singing team was their 15-year-old son, Hal Lonepine, Jr. on Gretsch guitar. The kid was incredible . . . and he later became even more incredible when he set the guitar and jazz world on its ear. In those later years he dropped the Jr. stagename and performed under his real name: Lenny Breau. The show also featured the Ward Sisters and steel/fiddle/bass player, Jack Paget, who came out later in a Grampa Jones type costume and persona to add a bit of comedy relief. The guest singer was a very young and dynamic Elvis impersonator named Ray St. Germain. Ray also went on to become a major performer with hit records, international tours and his own television shows. One of our greatest thrills was meeting Ray, one of our early influences, many years later at the Manitoba Association of Country Artists Award Show. We and Ray were both up for the Manitoba Entertainers of the Year Award. . . and Sue-On and I were more surprised than anyone in the room when we were announced the winners of this major award. A few years after the Bend appearance I saw Lenny a few times in Winnipeg. One time was in a coffee house ( I believe it was called The Establishment) where he soloed all night . . . on a Hofner bass! 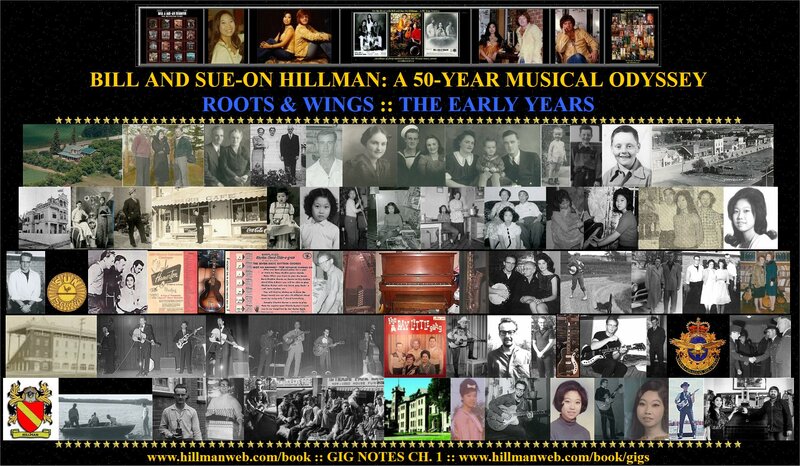 Another time was in the Town and Country lounge in the mid-'60s when he sat in with the Guess Who. Guess Who leader Chad Allen and I were both attending a summer school class at the University of Manitoba -- Atomic Physics of all things. I often joined Chad in evenings at the lounge where he, Randy Bachman, and Jimmy Kale were playing -- without a drummer. Gary Pederson was underage but for some reason was allowed to play with the house band up in the main showroom. As usual, Lenny's performances were quite unbelievable. Another big event during my teen years was the annual Provincial Exhibition in Brandon. A trip to Brandon would give me a chance to roam through the record and book shops. Brandon Fair always offered great entertainment on the Grandstand and the two big tent sideshows -- one with black performers, one with white -- had exciting bands and dancers, albeit a wee bit racy for a youngster. A few years later I would be performing on TV remotes and various stages at the fair, but in these early years the closest I came to performing was giving 4-H Club demonstrations and showing Rhode Island Red chickens since I was a member of the Strathclair Poultry Club -- not exactly a glamorous introduction to the world of show business. Meanwhile, on the other side of the world, in Hong Kong, Sue-On was coping with being separated from her mother who was stranded in China, and from a father in Newdale, MB, whom she had never seen. Her grandparents had enrolled her in a rather harsh and very foreign Catholic school and she was absorbing the metropolitan sights and sounds of this bustling English colony. Many Brandon music shows stand out in my memory - especially three shows featuring Johnny Cash. 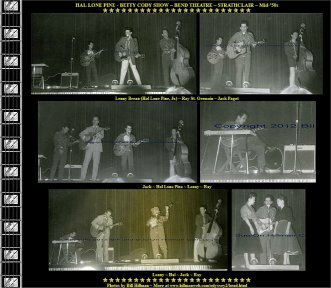 Seeing the first Johnny Cash / Jim Reeves Show in the old Brandon arena was a real thrill. I got some great photos. After the show when the stars headed across the arena floor to the dressing room area, the majority of autograph seekers followed after them. But Luther Perkins, Marshall Grant, and W.S. "Fluke" Holland of Johnny's Tennessee Three stayed in the stage area to pack up. This was in the days before roadies and big tour buses. I saw Luther alone at the side of the stage and made my way over to him to boldy ask if I could try out his Fender guitar. He said "Yup" and this led to my first real guitar lesson. Luther wasn't a really great accomplished guitarist... he probably didn't know many more chords than I at that time... but the lessons I learned in that short time about interaction with fans and the importance of creating your own style were invaluable. Luther's "boom-chick" style of damped guitar and simple memorable riffs is probably one of the most imitated. Sadly, he died in a house fire a few years later. Soon after Luther's death, guitarist, Bob Wootton, was enlisted to join the Tennessee Three. Wootton led the Tennesse Three (he does J.R.'s vocals and Luther's guitar) for many years after Johnny's death until failing health forced him to retire in 2014. We caught their show twice and video taped the second show we attended. I'm very proud of one of the after-show photos that my friend Bill Stadnyk snapped while I was chatting with Bob and "Fluke" Holland. The other major Brandon musical event for me was also at another old arena concert. One of the stars was Ferlin Husky, a dynamic entertainer whose contribution to country music seems to be somewhat overlooked. What impressed me most about the show, though, was his lead player. I could hear steel guitar sounds, but there was no steel on stage. Upon moving closer to the stage I soon deduced that the lead player was getting these long sustained sounds with the aid of a volume foot pedal. It wasn't long before I had bought a DeArmond pedal and was imitating his style -- a device I have used ever since, and is vital to my guitar sound and style. Back in the early days of television in Southwestern Manitoba, one of the highlights of "going to town" in Strathclair was to join the crowd huddled around the window of the Somers Electric shop. Set up for public display was a Westinghouse 19 inch television set which pulled in a weak signal from CKX-TV Brandon -- 60 miles to the southeast. Across this magic, flickering, black and white window to the world paraded a multitude of faces, places and sounds: movie stars, radio stars, variety performers, cartoons, TV actors, reporters, and singers. These small grainy images were all bigger than life, and unknowns became superstars overnight. The shows came from studios far and near: Hollywood, New York, Toronto, and Brandon... it didn't really matter where they came from... the performers were all fantasy-like figures in our minds. It was standing on this sidewalk, straining to get a better view of the small screen that I first "met" Brandon's Russ Gurr. Most of the music shows on TV in the early and mid-'50s featured singers in stuffy dress wear, sedately standing in front of an orchestra of seated, chart-reading musicians. Seldom would I see the instrument that had become my obsession -- the guitar. Then, one night, the small screen was filled with a strutting, posturing singer decked out in fringed shirts and western wear, singing country/western songs, and wildly flailing a Martin flat-top guitar. This was before the emergence of rock 'n' roll and this unfettered, stylistic performer stirred the vanguard of musical instincts which would soon blossom fully with the arrival of Elvis and all the Sun rockabilly stars. Little did I know that our paths would cross a few years later and Russ and I would share many adventures on the road. The arrival of my transistor radio meant that I now had a constant musical companion while doing chores. Great changes were also wrought by the arrival of television in our home. There wasn't much of the new music on the tube, but the Ed Sullivan Show had the occasional rock act: Elvis, Buddy Holly, The Everlys, Buddy Knox -- and CBC's Hit Parade show and Country Hoedown had some interesting moments. But the early days of TV were magical. I've tried to share some of the excitement in the CKX-TV Overview entry in this Odyssey. 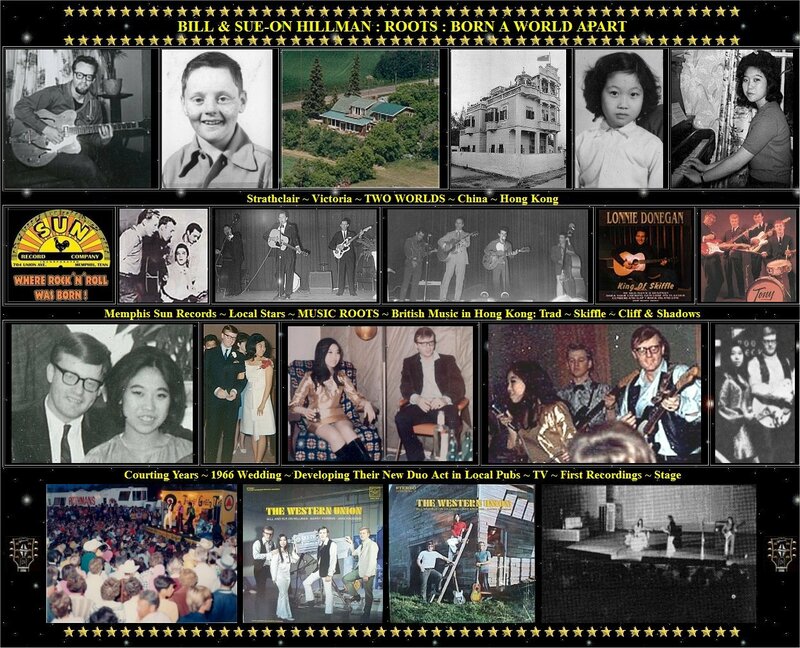 A few years later, whenever I went with the gang to functions in nearby Newdale, I always looked forward to having a coke or hot chocolate in Soo Choy's Paris Cafe because he always had a good stock of music magazines to browse through. We were sometimes served by his pretty young daughter, Sue-On, a cute and bubbly little girl who had recently come from Hong Kong with her mother. Her older brother Kenny and I were friends and classmates through grades 11 and 12.
www.hillmanweb.com/cadets I was a member of the Royal Canadian Air Cadets for eight years -- having joined as a Junior Cadet at age 11. My two weeks at Air Cadet 1960 Summer Camp in St. Jean, Quebec, gave me the opportunity to jam with another guitarist -- a real treat because there were very few players around home. He wasn't much better than I was, but he did a nice version of Honky Tonk and soon I had another riff added to my slowly growing guitar repertoire. I had hoped to take pilot training in Cadets, but my Nannie and the rest of the family would have no part of it. 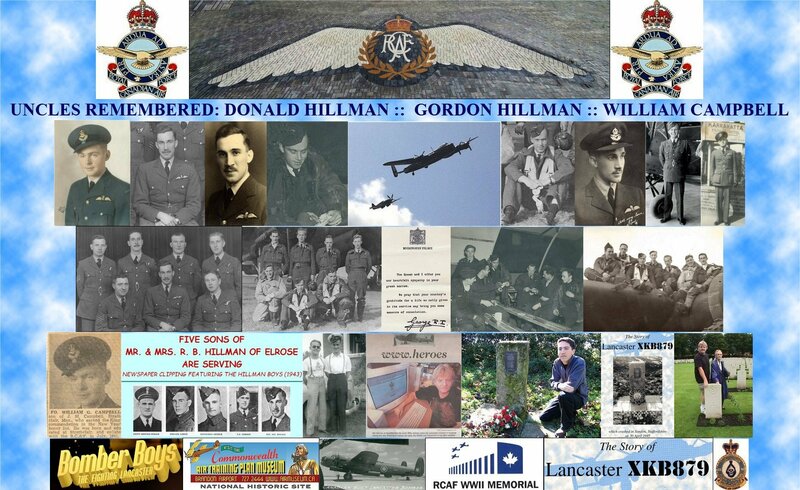 Memories of the Wartime losses of only a decade before were still too horrific in their memories. I had lost three uncles -- brothers to my Mom and Dad. They were pilots in downed RCAF Lancaster and Halifax bombers. My Harmony Monterey archtop had served me well, but it had many limitations. One day in the summer of 1960, while thumbing through the new Simpsons-Sears mail order catalogue, I came upon a picture of a guitar that seemed to offer everything I wanted in an instrument: a shiny black, gold-flecked Silvertone electric guitar. The $100 price was way out of my range, but my grandmother had been saving her pension cheques for an emergency such as this. The story and photos of this guitar, and of all the guitars that came after are featured in our Guitar Tales section. Mom and her surviving older brother, Don Campbell, had fond memories of the band that the three Campbell kids and neighbouring Christie kids had formed back in the '30s. In 1960 my obsession with music and the long hours I was spending with my new electric guitar revived their interest in jamming together. This led to a booking in Strathclair Municipal Hall and what was to be my first stage appearance. Our repetoire consisted of instrumental solos with my mom on piano and Barbara (Christie) Wyton on violin. I might have played a few numbers, probably something like Wildwood Flower and Under the Double Eagle, and my Uncle Don played rhythm guitar. We were pretty ragged and the whole experiment was short lived, but it was an exciting and encouraging experience for me. The best teen dances of my youth were at the Arena Dance Gardens in the nearby little town of Oak River. 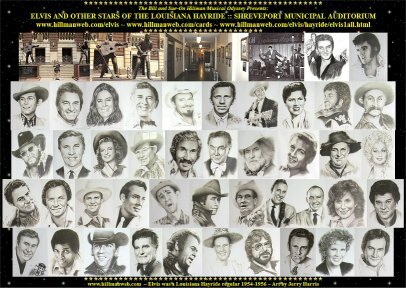 One night's show back in the early '60s that stands out featured Marty Robbins and his band. Marty was riding high with cross-over pop/country hits that included the classic El Paso. This was an event to look forward to because of the great guitar work on his hits (the guitarist on his recording sessions was usually Nashville legend, Grady Martin). On this particular night, however, Marty's long-time lead player (name forgotten) fell sick and had to leave the stage. Marty ended up playing lead himself for the rest of the night . . . occasionally sitting informally on the front edge of the stage. This was the first time I had ever heard fuzz guitar as the lead player had used the effect on Marty's hit, Don't Worry 'bout Me. Story has it that the effect on Marty's recording was discovered in the studio by accident when Grady's guitar solo was run through a guitar amp with a loose tube or through a faulty channel in the mixing console. Fascinated with the sound I bought the first fuzz pedal -- a Maestro Fuzztone -- soon after. The fuzz/overdrive sound went on to become a staple in the rock world. I was a real Marty fan and still have many off-air, reel-to-reel tape recordings of Marty's all-night phone-in request sessions on Ralph Emery's WSM radio show out of Nashville. Marty sang and played every request that was phoned in to the station -- for hours. He played guitar and piano behind these impromptu on-air vocals. Lonnie Donegan was a major influence on British music. Anthony James Donegan was born in Scotland in 1931. 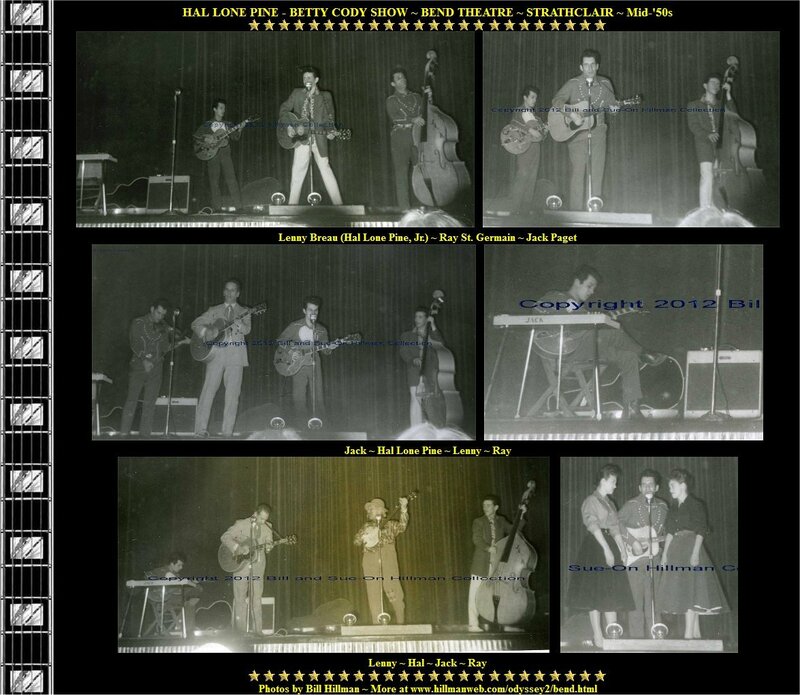 Early in his career his jazz band (The Chris Barber Band) opened for bluesman Lonnie Johnson. Donegan was a fan and in tribute he adopted the name Lonnie. He started the skiffle craze that inspired an army of music lovers to pick up guitars and look into American folk and blues music. Two young musicians who were captivated by the driving skiffle sounds were John Lennon and Paul McCartney from Liverpool. The repertoire of their first band was made up almost entirely of skiffle songs and guitar styles. One of the first albums I bought back in the late '50s was Lonnie Donegan: An Englishman Sings American Folk Songs. A hotspot for Donegan music in North America was Manitoba. Winnipeg radio stations picked up on this album and started a groundswell for Lonnie's records in the province. The most popular song off the album was "Frankie and Johnny" -- a rather unusual choice for such radio play since it hadn't been released as a single and its length was around five minutes -- in a time when nearly all hits were 2-3 minutes long. Interestingly, the second track on side 2 of the album was "Nobody's Child" which Tony Sheridan covered five years later in his recording session with the Beatles in Hamburg. I learned years later, during the "English Rock Invasion," that I was not the only one deeply influenced by Lonnie. Young Brits found it hard to obtain many US records and a burgeoning domestic pop scene developed in the UK. 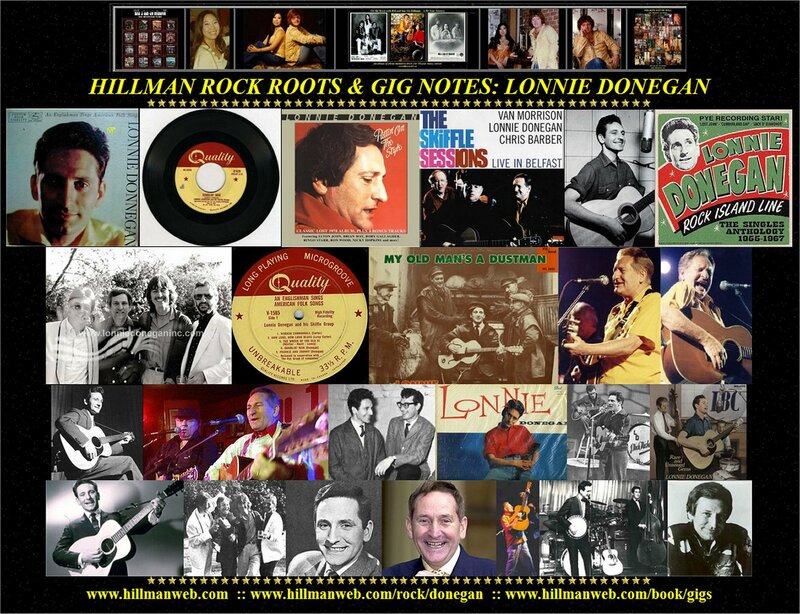 Leading the pack was Lonnie Donegan, "The King of Skiffle." His success was soon followed by homegrown acts such as Cliff Richard and the Shadows. Growing up in Canada in the '50s we were bombarded by American culture to the south, but we still had very close ties to Britain -- the best of both worlds. 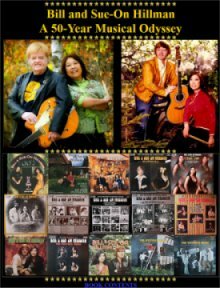 The success of Manitoba performers in the international entertainment scene owes much to this multi-cultural exposure which made them unique in many ways: comedians, folk and C/W singers, rock bands, writers, TV personalities, actors, songwriters, etc. all benefited. It is hard to find UK entertainers who came out of the explosive '50s-'70s who don't admit to Donegan's influence on their success. Up until the Beatles blitz he was Britain's most popular and successful entertainer. When John Lennon formed the Quarrymen in 1957, Lonnie's songs were riding the top of the British charts. 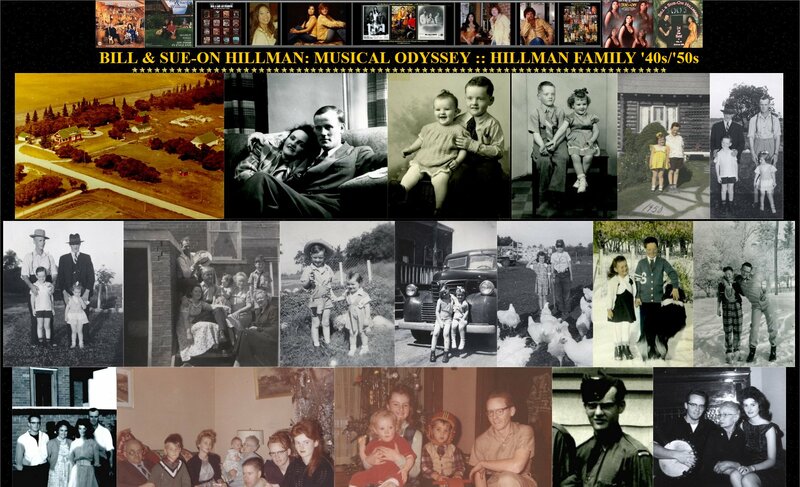 The majority of the Quarrymen's first songs were Donegan covers. In fact, the earliest known "Beatles" recording is of Donegan's "Putting On the Style." Ironically, The Beatles' success eclipsed Lonnie's popularity and he came to be considered passe for too many years. Sadly, I never had the opportunity to meet Lonnie Donegan or hear him in person. The closest I got to the man was during our 1976 tour of England -- we even played some of Lonnie's hits on our shows. Our MC/comedian for one of the workingman club gigs we played had emceed Lonnie's show the night before. I pestered the poor guy all night with questions about the Skiffle King. Earlier in the year, Lonnie had suffered a heart attack and undergone a heart operation, and the show the night before was billed as a farewell concert. A few years later, however, veteran trouper that he was, Lonnie returned to show biz. Two of my favourite albums came later in Lonnie's career: He was joined on the 1978 "Puttin' On The Style" sessions by a host of rockers who wanted to acknowledge his influence on their music. Among the guests on the album were Ringo Starr, Leo Sayer, Albert Lee, Brian May, Elton John, Klaus Voorman, Ronnie Wood, Jim Keltner, Nicky Hopkins, Rory Gallagher, Alan Jones, and many more. Much later, his acclaimed "Live in Belfast 1998" album was done with Van Morrison, Chris Barber, and Dr. John. Lonnie Donegan died in 2002, aged 71, after suffering a heart attack while on tour, shortly before he was due to perform at a memorial concert for George Harrison with The Rolling Stones. I owe a great debt to this man who introduced me to American blues and folk music, English music hall performances, and Jazz, dixieland, and skiffle -- and fed into my passion for guitar. This long "Root Years" pre-amble sets the stage for the start of a 50-year on-stage odyssey. What follows are more anecdotes laid out as "Gig Notes" or "Road Tales"